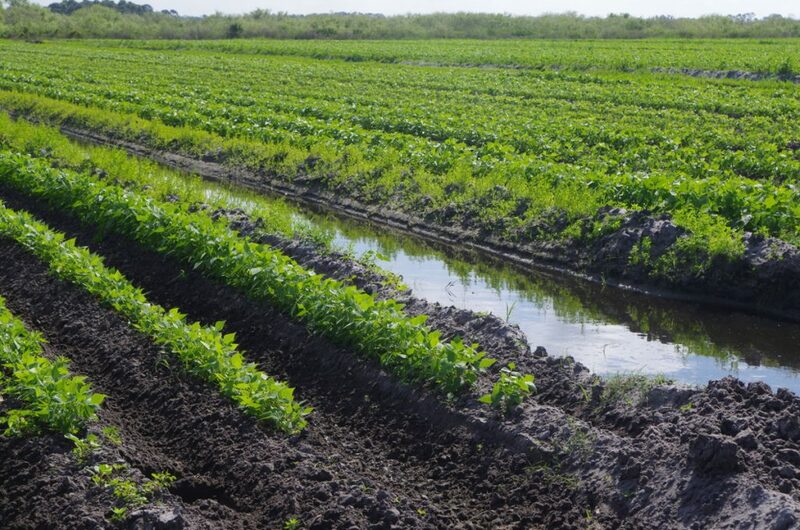 One fascinating thing about visiting Southwest Florida farms is seeing their distinctive seepage irrigation system. I had heard it described, but I didn’t really get it until I saw it in action. 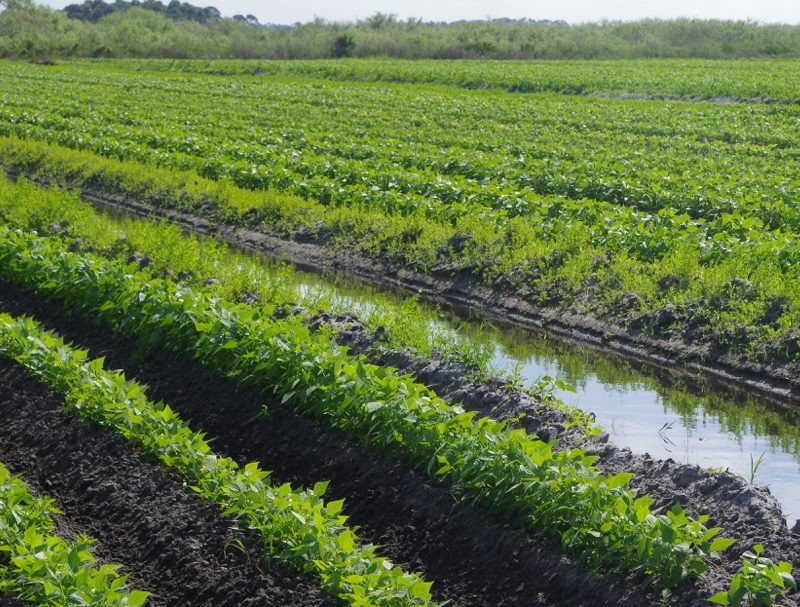 Unique soils in Florida have allowed growers there to develop a an effective irrigation system that differs in many respects from what I have seen anywhere else. Sandy soils overlay a hardpan just below the maximum rooting zone. That situation allows lateral seepage of irrigation water over considerable distances with hardly any slope. 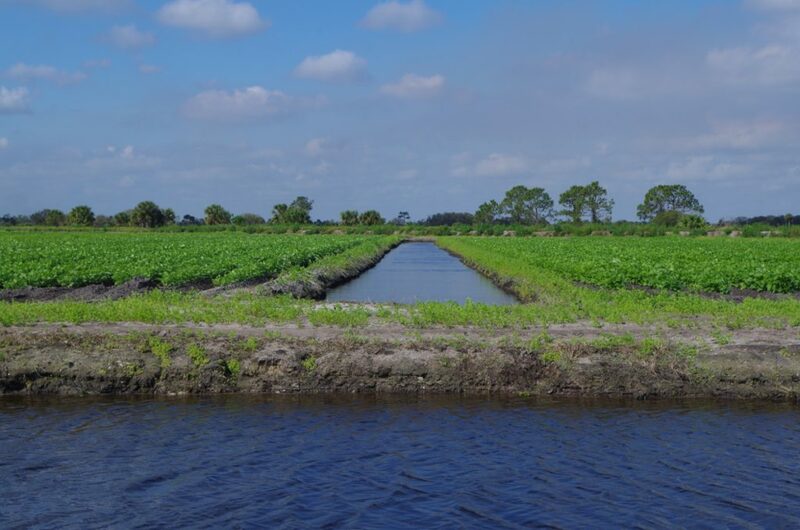 Main irrigation canals move water from water reserves in the abundant swampland to the fields. To irrigate a field, irrigation ditches are filled from those canals, then emptied when irrigation is done. Irrigation water seeps sideways into the soil from the ditch. It reaches far enough that there are 12 beds between ditches. The water level is maintained precisely so that soil under the roots is wetted, but the roots are not drowned. One of the significant advantages of this system is less disease. Because all the water stays underground, it is rarer for the foliage to be wet and the humidity, while naturally high, is lower. Thus the conditions for fungal spores to germinate and for hyphae to grow are considerably less common. A couple other unique features make the system work. First, the land is very flat. Whole fields can be irrigated where the underground water table is maintained at an exact distance below the soil surface on the bed tops. In addition, field are interspersed with vast swamplands that serve as storage for irrigation water. Irrigation water can not only be drawn from these reservoirs, but it is also returned to them at the end of an irrigation cycle.